Music continues to work for TV networks. The grand finale of Seven’s All Together Now saw 717,000 overnight metros tune in to watch 33-year old Fijian-born Brisbane-based Lai Utovou crowned numero uno and pocket the $100,000 prize. It was the third top show of the night, beaten only by Seven and Nine News. It topped the 16-39 and 18-49 age groups. The finale of ABC-TV’s The Set last week drew 162,000 overnight metros. Its inventive format saw fans and viewers get a greater understanding of what pushed the buttons of guests – the episode of The Rubens was a standout – and hopefully returns to the screens. The second episode of Guy Sebastian’s Don’t Stop The Music (ABC) drew 443,000 after the debut saw 518,000 tune in. Missy Higgins & Friends Live, as part of the ABC’s Ausmusic Month, took in 263,000 viewers and made it into Sunday’s Top 20. AC/DC landed four albums in a worldwide poll of the greatest rock albums by the UK’s Louder website. The Australian band’s Back In Black was at #3, after Pink Floyd’s The Dark Side Of The Moon which topped the list, and Guns N’ Roses’ Appetite For Destruction at #2. The Beatles’ Sgt. Pepper’s Lonely Hearts Club Band at #7. Rounding off the Top 10 were Iron Maiden’s The Number Of The Beast (#9) and Led Zeppelin’s Physical Graffiti (#10). Elsewhere in the list, Highway To Hell was at #30 and Let There Be Rock ranked at #48. WA all-ages volunteer-run Hyperfest has been cancelled for “lack of ticket sales”. Only 20% of tickets had been stubbed. The event was to take place om Midland on December 8 with DZ Deathrays headlining and with Polish Club, Ruby Fields, Sam Perry and Mosquito Coast. It was set up by the City of Swan 15 years ago. The UK parliament’s Intelligence and Security Committee released a report that the lethal extremist attack at Manchester Arena last year after an Ariana Grande concert in May 2017 may have been prevented if not for shortcomings by security services. It said that 22-year-old suicide bomber Salman Abedi, who killed 22 people, first came to the attention of the MI5 domestic security services in 2010 and was briefly investigated in 2014. MI5 “moved too slowly” it said. Despite its concerns about the man’s possible extremism, M15 did not place travel restrictions on him nor monitor his travels. Hence Abedi could “return undetected” from Libya to Britain days before his attack. $6.5 million what Craig McLachlan is demanding in a defamation case. 13,000 attended One Electric Day at Werribee Mansion in Melbourne, starring Jimmy Barnes, The Angels, Ian Moss, Jon Stevens, Richard Clapton and Thirsty Merc. 6000 miles flown by Nicky Minaj to play a festival in Shanghai only to discover that the event was an alleged scam. The Djakarta Warehouse Project China festival was accused of being an unauthorised spin-off of a similar event in Indonesia. $1.6 million, what Skrillex has been ordered to pay a fan in compensation following an injury at a gig in Los Angeles. Jennifer Fraissl claimed she suffered a stroke after the DJ stave-dived on her during a show at the Belasco Theater. 58% of millennials discover new music on social media, according to Instagram’s forum Instalounge in Sydney. The forum also noted that five of the Top 10 global Instagram accounts are music. The Red Hot Chilli Peppers’ A Day On The Green Saturday, March 2 show at Mt Duneed estate in Geelong, Victoria, sold out all 20,000 tickets in just a few minutes. Michael Newton, a co-founder of the winery shows brand, said it was “one of the fasting-selling shows” in its history. Meantime, the American Express Twilight at Taronga added a second Xavier Rudd show on Sunday, February 17 after his February 16 show sold out. The Waifs and Bjorn Again earlier added second shows. The 16 shows of summer series at Sydney’s Taronga Zoo have seen the sell-out sign also placed for The Whitlams, Hoodoo Gurus (two sold-out dates) and Vera Blue. Yesterday a Comedy Under The Stars show was added for Saturday, March 9 with Umbilical Brothers, Dave Hughes, Cal Wilson and Nick Cody. The Jungle Giants have achieved gold accreditation from ARIA with two singles ‘Used To Be In Love’ and ‘Feel The Way I Do’, from their third critically-acclaimed album Quiet Ferocity. The tracks ranked #16 and #59 respectively in the triple j Hottest 100. Quiet Ferocity, produced by lead singer, songwriter, guitarist Sam Hales, and self- funded by the band, it racked up well over 50 million Spotify streams and landed at #7 on triple j listeners Top 10 Albums of 2017. Jungle Giants close out the year with sets at Beyond the Valley and NYE In The Park. Sydney rapper and activist L Fresh The Lion’s YouTube Creators For Change project, Culture Strong had two wins at the Made In The West film festival – but he was not there to pick up the trophies. He was in Atlanta putting in 14-day shifts in the studio with Morgan Garcia as news came through that the film won runner-up for Best Film and won Best Editor for Joey Hunter. It includes a poem I Love You She Said written by social worker Jatinder Kaur who works with victims of domestic violence in the Indian community living in Australia. Australia has come in at #3 in the Junior Eurovision Song Contest 2018 at the Minsk Arena, Belarus. Poland took the top spot, with 215 points with France placid second with 203..
Australian’s entrant,12-year old Jael, performed her uplifting pop-power anthem “Champion” and received 201 points. The Voice, (TV Studios Australia) was beaten by Gruen (CJZ) at the Screen Producers Awards in Melbourne. 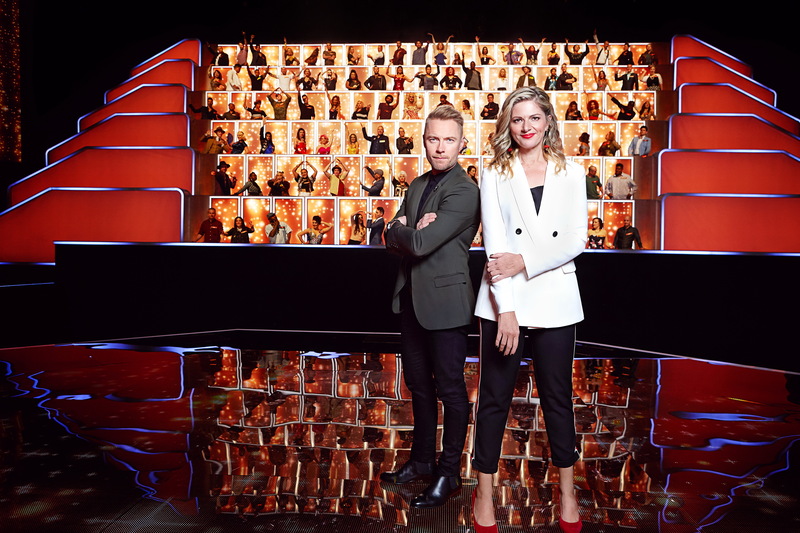 Both shows were up for the Light Entertainment Series Production of the Year category against Talkin’ Bout Your Generation (ITV Studios Australia), Everyone’s A Critic, (\Matchbox Pictures) and Hughesy We Have A Problem (Screentime). Childish Gambino’s toe injury might have forced him to postpone his Australian and US dates. However, he did hobble to New Zealand on the weekend to attend his three-day virtual reality cultural Pharos festival outside Auckland. Attendees were asked to wear green or their favourite “frequency” colour. He met with Maori nation reps in the Tāpapakanga Regional Par wearing a a kahu huruhuru, or feather cloak and signed a painting of himself. He and his crew performed a waiata, a dedication to nature in song. It was a pretty spiritual and visual experience but it rained all three days and some took to social media grumble about the long queues into the site’s plastic performance dome. After a $1 million revamp “inspired by Palm Springs”, Taren Point Hotel in NSW re-opens with an extensive music program, which kicks off with a show by Richard Clapton on Friday, December 7. One of the award-winning Feros Group venues, the renos included a new bistro, lounge bar, beer garden and family-friendly laneway with a food truck inspired by venues in Melbourne and Brisbane, and two children’s play areas. With Bloods’ bassist Sweetie leaving the band as she is moving to Melbourne, the band is working on two farewell initiatives. There are final shows with her at the Union in Sydney (December 8) and Old Bar in Melbourne (December 14). Girls Rock! Sydney and re-recorded “No Fun” a track from their first EP Golden Fang. Music Victoria holds its AGM at 6 pm on Thursday, December 7 at its headquarters at Level 1, 49 Tope Street, South Melbourne, from 6 pm. Scott Allan was a lighting designer based in Melbourne who worked in the theatre, dance, corporate and education sectors. He started out in theatres in his hometown Newcastle before moving to the Arts Centre Gold Coast where he was resident lighting designer and production manager for 12 years and technical manager for Deakin University. He was a mentor and researcher, a professional member of the Association of Lighting Designers (ALD), and Treasurer of the Australasian Lighting Industry Association (ALIA) for seven years. After some rather powerful shows in Australia, Gang of Youths start next week a nine-date North American tour with their friend Gretta Ray. Starting on December 2 in Nashville, it takes in Columbus, Toronto, Philadelphia, Washington DC, New York, Alston, Chicago and winds up on December 12 in Indianapolis. The lion tattoo on Ed Sheeran’s torso is such a stand-out that its artist, Kevin Paul, says a UK millionaire has offered 300,000 for rights. Paul hasn’t decided as the tattoo was a gift to his red-haired buddy, whom he says proved to be a strong force when he and his wife underwent two miscarriages. Melbourne record store Pure Pop Records, which closed in 2014 after complaints about the noise of bands that owner Dave Stevens got to play in its small courtyard – including some overseas names as The White Stripes and Gen Hansard. Some acts are holding a reunion at the MEMO Hall on December 2, counting off Gallie, Charles Jenkins, Xani Kolac, Georgia Fields and comedian Ryan Coffey. Victoria Police and Bayside Council in Melbourne are closing down illegal beach raves at Half Moon Bay on the Black Rock foreshore. Popular Moscow rapper Husky was sentenced to 12 days jail for “hooliganism” for performing on a car when authorities banned his gig. The 25-year’s raps send up authorities and accuse police of brutality. Husky said he was tired of playing on the streets because authorities kept shutting down his club shows, and offered to pay compensation to the owner of the car. He rewrote the book of songwriting way back then. Now Bob Dylan has rewritten the etiquette of appearing on a TV talk show – and not talking. He turned up on Jimmy Fallon to plug his new whisky brand. In pre-recorded footage, the two shared a glass while watching a circus troupe – and then he disappeared. As in blowin’ in the wind.